This is a lot more difficult than you would first have thought. Give it a go before you ask children to do it. 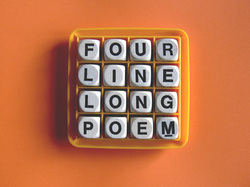 The idea is that you think of four words that are four letters long and fit on four lines. The four words must create a sentence or statement that makes sense though. 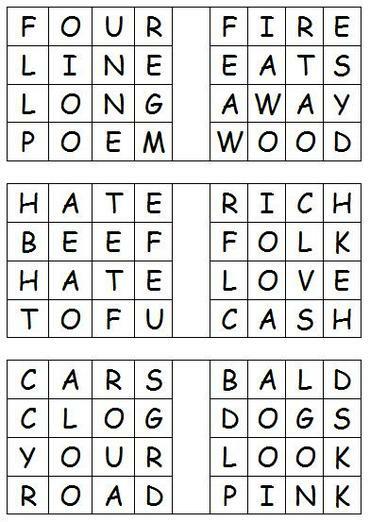 If you are looking for a challenge, the children should try to create lots of these four line poems that when read through, create one long poem on a topic of your or their choice. This is a good activity for persistence, trial and error, and for dictionary and thesaurus work. A great chance to play with words! Quick Note: The Four Line Long Poem is a creation (invention) of Alex Valentine, who has created a series of these poems. Alex Valentine is a singer-songwriter from London and has used these poems in his videos. Please note that these poems are copyright owned and keystage2literacy has been granted use of these poems for the purposes of Early Morning Work.